Land Rover has unveiled its brand-new Discovery Vision concept car alongside SpaceShipTwo, the world's first commercial passenger carrying spacecraft in New York. The partnership has been unveiled ahead of the New York Auto Show and will see Land Rover vehicles become part of daily life for the Virgin Galactic team, with a fleet of vehicles based at the Virgin Galactic test centre and at its operational New Mexico base, Spaceport America. 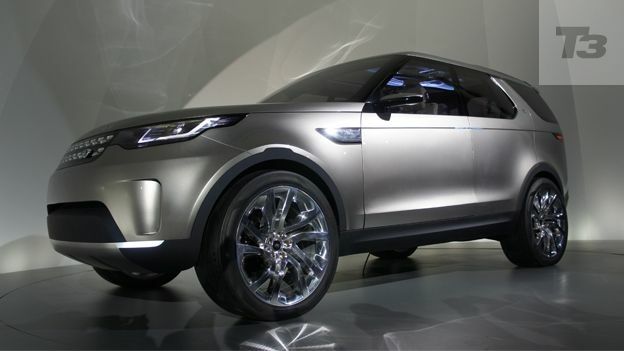 The car is Land Rover's most futuristic concept yet and features augmented reality technology to display a 'see-through' view of the terrain ahead, making the front of the car 'virtually' invisible from inside the cabin. As well as advanced augmented relaity is the ability to remotely control the car using a smartphone or tablet device. By connecting to a secure WiFi hotspot link created by the car the driver can then safely steer the car using the tablet at very low speeds. Gesture Control allows you to open the doors, operate the indicators or turn on the headlamps by moving your hand, while Laser Referencing projects visible markings, symbols and imagery onto the ground to aid low speed or tricky manoeuvres. The steering wheel incorporates two small OLED touchscreens to operate the infotainment system and indicator stalks are redundant as turn signals and headlamp functions are operated by gesture control. All of the windows feature Smart glass technology, which overlays real-time information onto the view of the surroundings as seen through the windows by the driver or passengers. The smart glass can work in conjunction with eye-tracking sensors and the vehicle's sat-nav system to identify that, for instance, a passing landmark is being observed by one of the vehicle's passengers - and displays relevant information, such as navigation or tourist data, to that passenger. That information can then be swiped from the window directly into a passenger's seatback infotainment screen, or - adding in the functionality of passengers' personal devices - even to a docked tablet or smartphone. The headlamps utilise advanced laser technology to generate bright, far-reaching beams of light, paired with LED daytime running lights. Slim foglamps on either side of the undershield are capable of emitting both infrared and coloured lasers, which assist in the Laser Terrain Scanning and Laser Referencing functions, according to Land Rover.